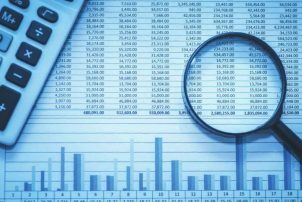 My Technology Budget was Approved, Now What? Your Parking Access and Revenue Control System (PARCS) has needed an upgrade for quite a while now, and you have put together a budget request for administration to review. Last year it was not approved, but at least you got the idea out there for consideration. This year however, administration reviewed your request and after an exhaustive interview process they have approved your budget; but only at 80 percent of your request. Let the fun begin! First, let’s begin by looking at your facility. 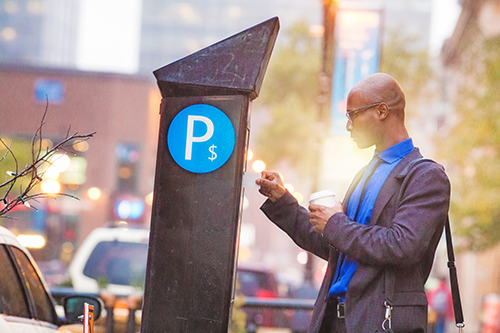 What are the Parking Access and Revenue Control System’s minimum components? A traditional PARCS has the ticket dispens­ers, barrier gates. cashier stations at exit, the facility man­agement software and server, a PCI Compliant credit card system, and an intercom system. But what about today? All the buzz is about Pay-On­-Foot machines to replace the cashiers and save labor, automated parking guidance systems to reduce emissions and allow patrons to find a parking space quickly, license plate recognition to thwart attempted fraud and speed the exiting process, on-line parking reservations. and pay-by-cell applications… Maybe you wanted all this technology, but administration cut 20 percent of the requested budget. How do you prioritize your perceived needs? Pay-on-Foot is said to save labor because you can displace your cashiers to other positions and cut back on the hours they spend in the booth. But is this the right move for your facility? Ideally, customers take a ticket to enter the facility, go to their destination, and on the way back to their vehicle, they stop and make payment at the POF. Hurray, it worked! What if the parker doesn’t take the ticket with them? Must they walk to the car, get the ticket, walk back to the POF, pay, and walk AGAIN back to the car? The solution is simple; pay with a credit card at exit. What it they don’t have a credit card, or don’t want a charge on the card? Simply press the intercom and a customer service person will assist them. Wait, isn’t that the employee that was the cashier? How about these Automated Parking Guidance Systems? There are three “levels” of APGS: Facility Count, Level Count, and Single Space Count systems. Facility count APGS provides a total count of the spaces available and can provide drivers with information as to whether there are spaces available or not. The level count APGS has counting systems between the facility “floors” to show a driver, upon entering the facil­ity, which level has available spaces. These are particularly helpful for structures with medium sized parking floors. In this configuration, if the sign shows full on levels 1, 2, and 3, the parking patron can go straight to level 4 or higher without having to search the full levels. Single space APGS provides all the same conveniences as facility and level count APGS but is preferable when the parking floors are large with multiple rows. Now the patron can exit the ramp on level 4 and can see which row has available spaces. Lean on your colleagues who have gone through this process before and who have already experienced success (and perhaps more setbacks than they’d care to admit). License Plate Recognition is another technology you may think you need. Maybe you have customers at the cashier lane all the time saying, “I lost my ticket.” so you implemented a nightly license plate inventory. Perhaps you think they are trying to defraud the system. Perhaps after accruing a large parking charge, they are asking a friend to drive into the garage and give them their ticket. An LPR system would stop that type of fraud and prevent lost revenue. When the patron tries to use the swapped tick­ et, the license plate recognition won’t match, so they won’t be able to get out for free. 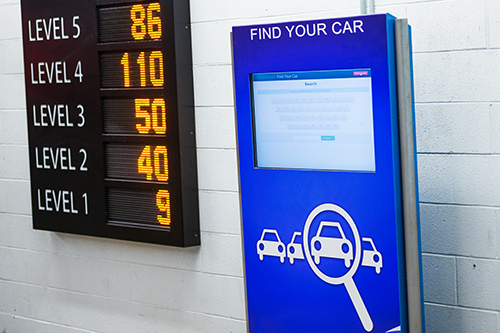 The attendant can then search the database and charge for the full amount of time parked. Or perhaps you’re considering on-line reservations, which should put you at the forefront of parking garage technology. Your customers can make a parking reservation online and your software will “hold available” a space in the count system for them. When they arrive, they can just scan the barcode on their phone upon entering and then again when they exit the facility. Pay-by-cell is like the online reservations system, but customers can “buy on the fly” fortheir parking. Customers can download an “app” on their smart phone and when they pull into the garage they can take a ticket like normal, but then when they get to the exit. the customer simply inserts the ticket, scans the barcode on their phone, and can then exit. So, you know you need the new ticket dispensers, inter­coms, and barrier gates at the entry points. And you’ll need the cashier terminals, intercoms, exit verifiers and barrier gates at the exit points. But your budget was cut, so how can you know which options you should cut from the sys­tem to stay within your budget? What about Pay-On-Foot? The pros include express exit since the transaction is taken out of the lane, the customer can pay with cash or credit 24/7, and save some operat­ing with fewer cashiers. But the cons include increased capital expense to run conduit and wiring for power and communications, cash vaults and receipts must be emptied and replenished, there is increased potential for bill jams and ticket jams, and increased opportunity for fraud if a customer claims to have paid and the machine “ate” their ticket (or other stories). The APGS is a great idea, except the facility counts and level counts systems aren’t always 100 percent accurate, which means frequent recalibration of the system. You may need to have an attendant count the available spaces and adjust them in the software module. LPR sounds like a great idea for an airport or university campus, but what if your garage empties every night? If you don’t have any customers trying to avoid large payments for multiple day stays, do you really need it? Perhaps you know of online reservations that were implemented at another garage and the customers kept taking a ticket when they entered instead of using their barcode. This meant there was only one car in the garage, but the system still had their space reserved. With all of these pros and cons, it can be difficult to know what to think about the APGS, LPR, Online Reservations, and Pay-by-Cell services.? Where can you turn for advice? Certainly, a parking consultant, particularly one with technology expertise, can provide advice. New technolo­gies are constantly being introduced, and it never hurts to have an experienced expert to help you navigate the technology minefield. Another option is to join your local parking association and receive some advice from others in the industry. Lean on your colleagues who have gone through this process before and who have already experienced success (and perhaps more setbacks than they’d care to admit). Finally, consider attending industry shows and sympo­sia, like the Parking Industry Exhibition. 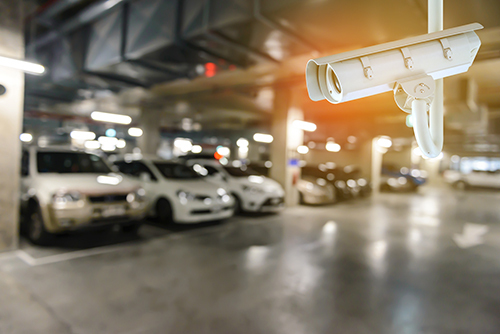 There are always presentations about the newest technologies, and these shows provide an opportunity to speak directly with ven­dors and other parking owners and operators facing the same choices. By Geoff Posluszny, Consultant with Walker Consultants. As printed in July’s issue of Parking Today.